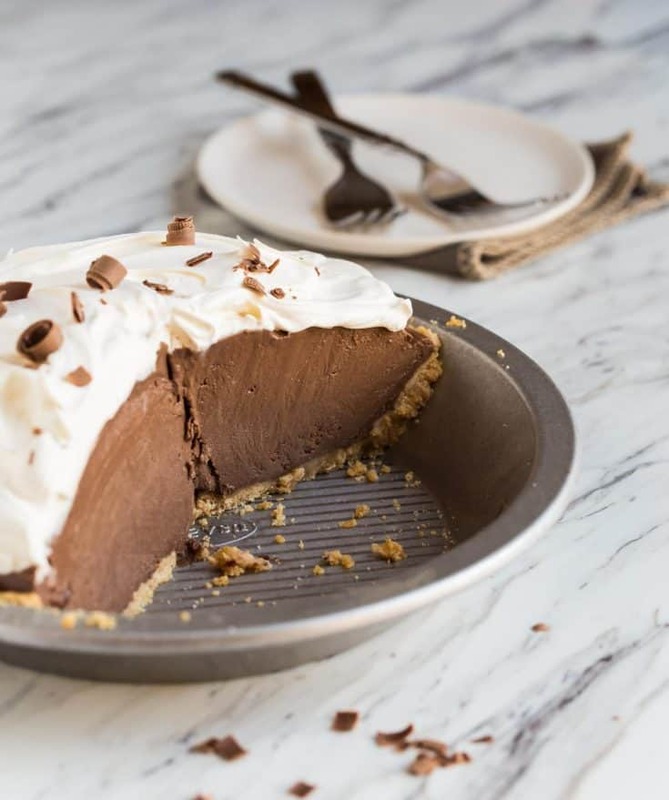 Sometimes you need to go big or go home and this Chocolate Pie is the perfect way to do just that. The trend these days is to eat healthy, real food full of whole grains and low in saturated fat. Sometimes healthy eating can taste so good, you don’t even notice the substitutions. But there are times when low fat and healthy just doesn’t cut it, and this Chocolate Pie is one of those times. Once you try it, I think you’ll agree with me. I had no idea that you could buy cake mixes in boxes, and I certainly had never had a store-bought pie. That was just how our family rolled. No judgments on anyone who does things differently; homemade was just what we knew because my mom loves to cook. Luckily her passion was passed on to me. 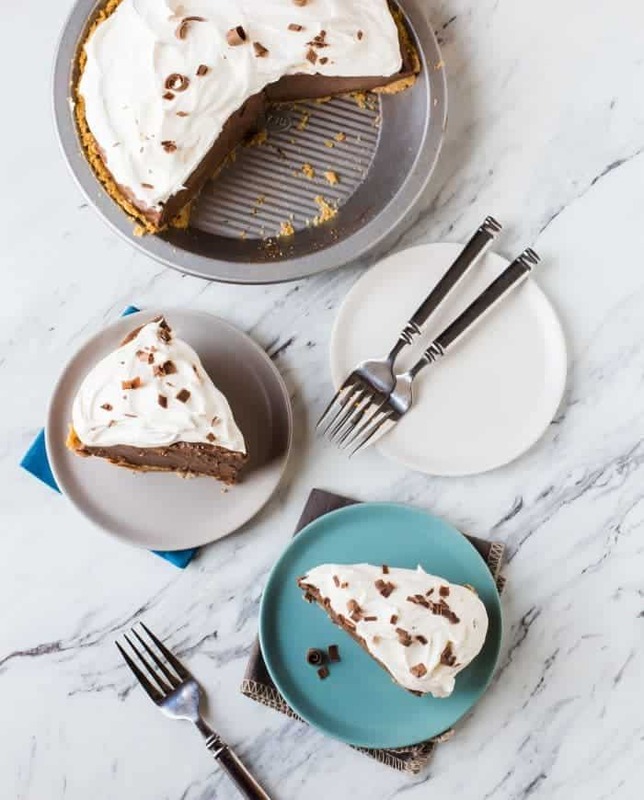 This Chocolate Pie has always been a family favorite. My mom made this frequently when we were growing up and now, it’s one of our Thanksgiving desserts. How fabulous is that? And you know what makes it ever better? It’s a vanilla wafer crumb crust, so you don’t have to roll out a pie crust. Such a great contrast with the chocolate cream filling, and oh, so delicious. Yeah, this pie says, go big or go home. And it is worth every.single.bite. Make-ahead Tip: This pie freezes well, however, wait to top with the whipped topping until you are ready to serve it! Mix the first three ingredients together. Press into a ten-inch pie plate. Bake for 8 minutes. Cool and set aside. In a microwave safe bowl, heat chocolates and butter until just melted. Reserve. In a heavy sauce pan, whisk together sugar, corn starch, salt and egg yolks until combined. Add milk gradually whisking all the while. Bring the milk mixture to a boil over medium heat (takes 7-10 minutes) and stir until boiling. Once boiling, boil for 1-2 minutes, until thick-like pudding. Stir in melted chocolate and butter mixture and vanilla. Cover surface and cool. Pour cooled filling into the cooled crust and chill at least 6 hours. Cover with whipped cream before serving. I see that this calls for bittersweet chocolate chips. Is there any other name for them other than bittersweet. I can’t seem to find them. There is milk chocolate, semi-sweet chocolate, german chocolate. etc. By bittersweet do you mean like a Hershey’s Special Dark chocolate bar? This recipe sounds and looks fabulous. I really want to try it. Thanks. You can use a bittersweet chocolate bar and chop it up. Works great! Let me know how it turns out. Enjoy! What a dreamy pie! I love chocolate pie and this is the best I’ve seen. Thanks, Maureen! It’s a favorite of ours too! I could seriously use a piece of that pie right now! I don’t think I’ve ever had chocolate pie, I know, gasp! That needs to change. Seriously, this is the most delicious Chocolate Pie you will ever eat. It is easy to make and really has a wow factor when serving to guest! Thanks again for a fabulous recipe! My family fell in love with homemade chocolate pie the first time I made it. We haven’t gone back to store-bought or even splurged at a restaurant since! Oh man, I love a good chocolate pie! I love how thick and creamy this pie is! I think homemade is the way to go, especially now that I have this recipe! Thanks for the note and the pin, Trish! I am seriously drooling over that creamy chocolate pie! What I would give for a huge slice of that goodness!!! What a magnificent looking chocolate pie. I love it. I really need to make this soon. First I need to get to the store to buy more chocolate!